Scrapping & Stamping Till the Kids Find Me! 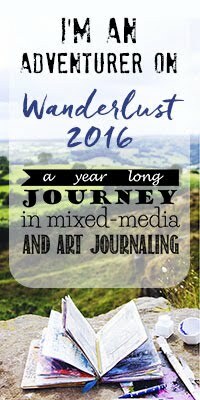 I'm on my way with Wanderlust..... I had thought that I would fall way behind as I hadn't had time to watch any videos or craft at all in January. It was on my horizon that Deco Art had set up a challenge that ends 'gasp' today! I dropped my housework, all the laundry and the little voice in my head and hit my studio :). 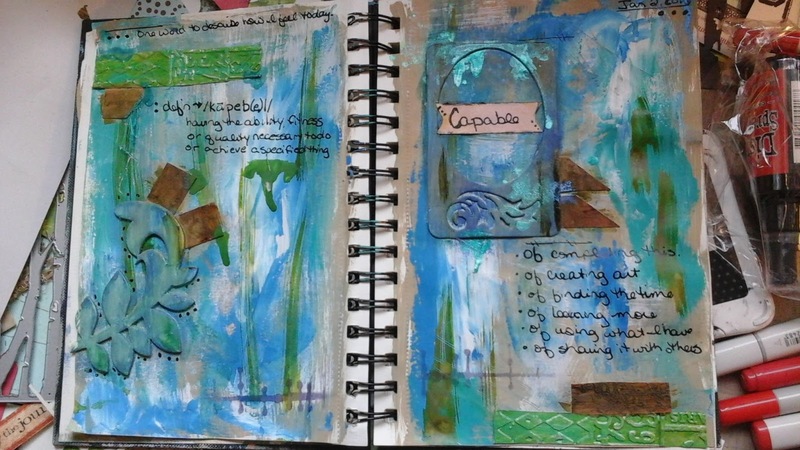 I created a journal entry using Kazia's prompts and the quote "That which you are most afraid of doing may be that which finally sets you free". So in love with how this turned out! I used a Pop It Up from Karen Burniston and started playing. My Nephews birthday is at the end of the week and I wanted to make a fun card for him. Tims Bird Crazy stamp and die from the Funkie Junkie Boutique. Copics which were dusty on my desk ;) and scrap paper. The trees are left over from my Christmas cards where I used the birch tree die from Tim Holtz. the greenery was just sitting on my desk. Cut from an old book and sprayed with ?Dylusions spray? 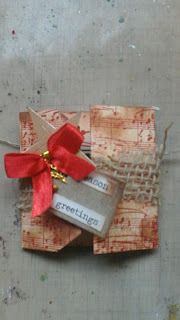 A scrap of twine and some stamps from Close to My Heart (all retired). I used my Nestabilities to cut the circle out of black and white paper. 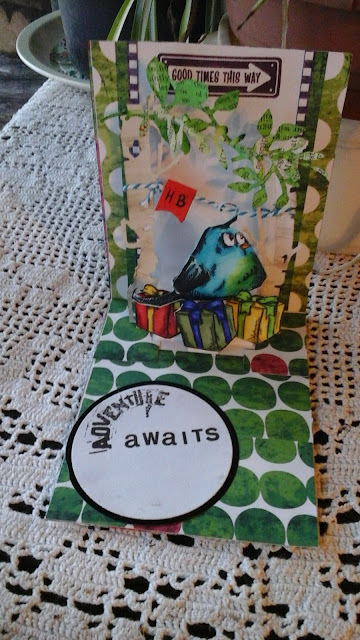 The front of the card was kept simple, so the surprise really wow'ed when you open it. 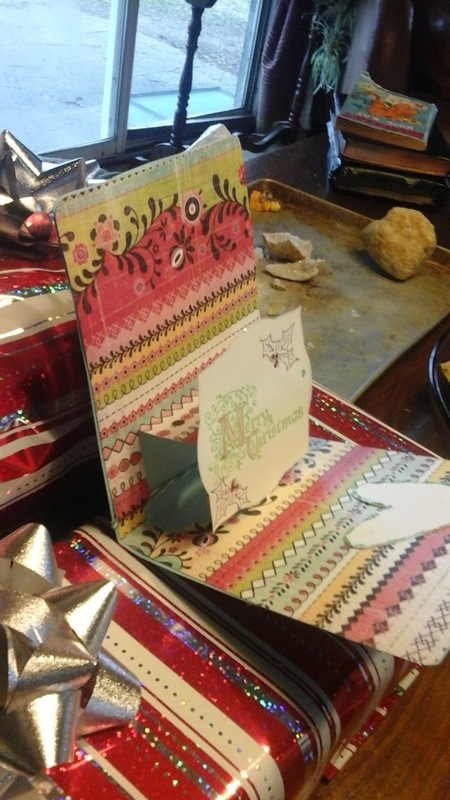 This is a take on Shelly Hickox's card from 2012. I had finished it and never shared it. 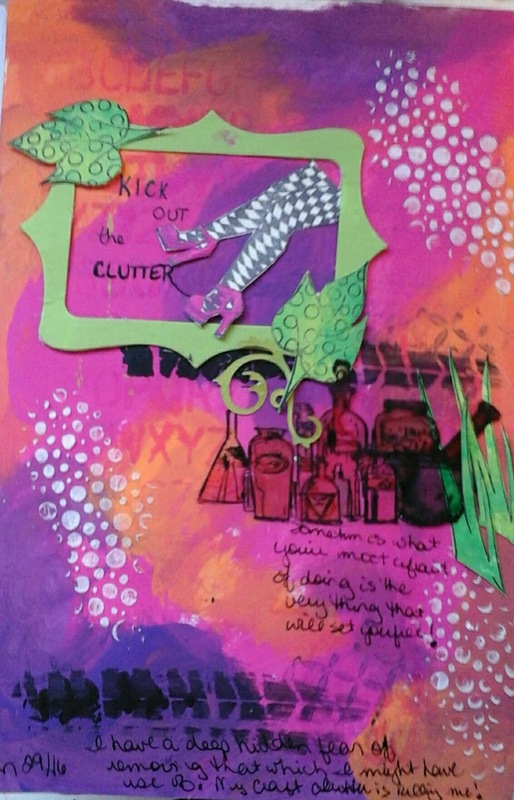 It's another pop up from Karen Burniston. My first one ever actually. I followed the lesson rather closely as I have not played at art journaling before and I am a little rusty....I don't like the green blobs of paint on the right, but overall....not bad for a beginner.I used a little of everything, my page is quite shimmery thanks to Lindy's Stamp Gang sprays and old nail polish. 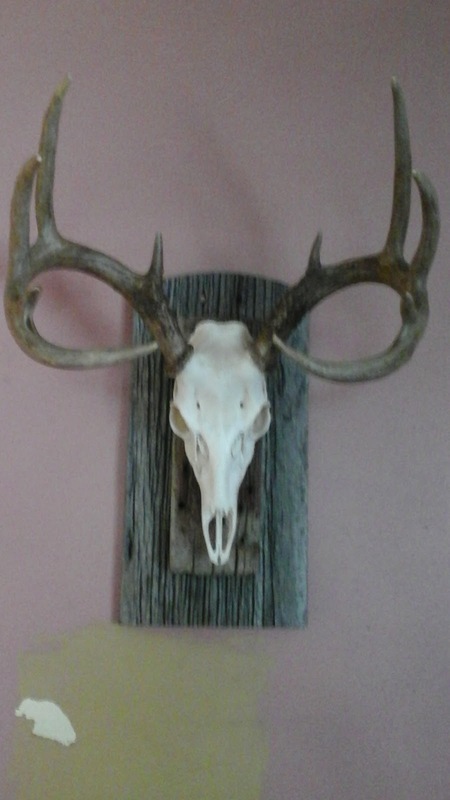 On an aside....my crafty man decided to tap in to his potential.....he shot this buck in the fall and mounted it himself. 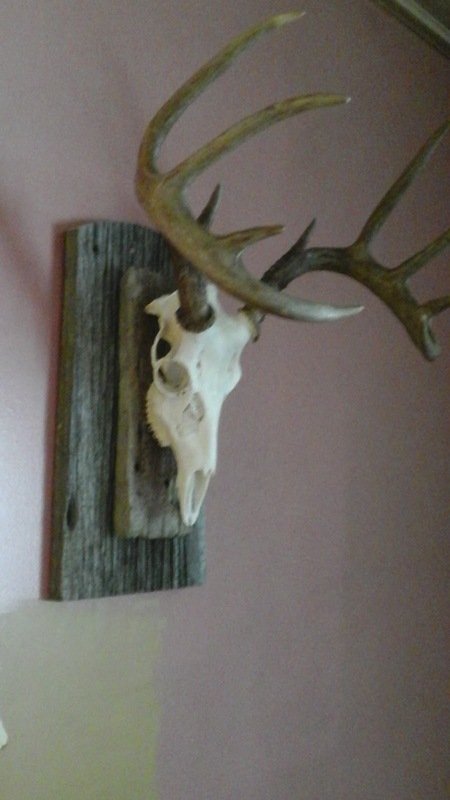 He used barnboards from our dilapidated barn as the mounting boards. Not bad for a guy that doesn't let that side of himself out very often. The 12 Tags of Christmas Funkie Junkie Style cont. Tag 7 : ahhh, I wish this was clear. 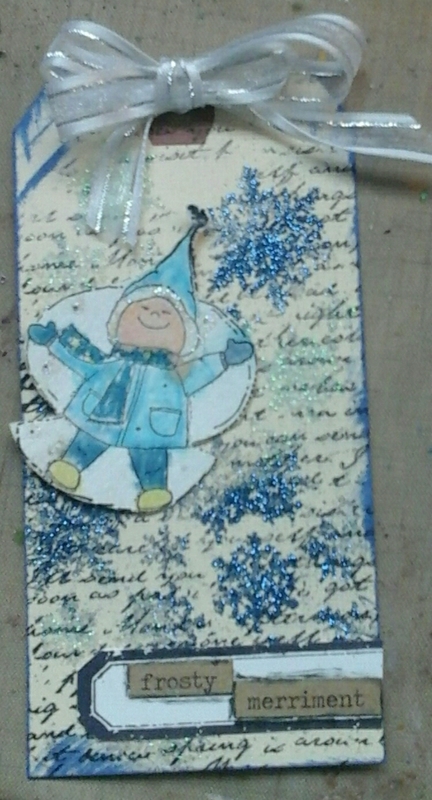 I was inspired by Lindas tag this week, but had to use this little guy :) Frozen colours, text in the background. I used a Tim Holtz snowflake stamp and sticky embossing powder over the text stamp (CTMH, background stamp much loved and old :)) I then used dollar store fine glitter over the stickiness to get the colours. a little boy (Eat Cake Graphics), a sentiment and ribbon makes for a cute tag for someone! Tag 8: I thought the first tag was my favourite, and then the 7th tag....but this is beautiful irl. 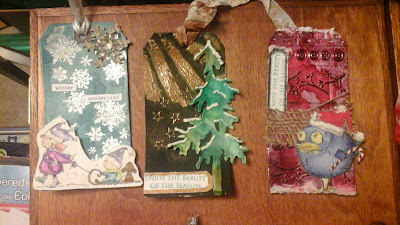 I liked Linda's trees and the ribbon trailing down. 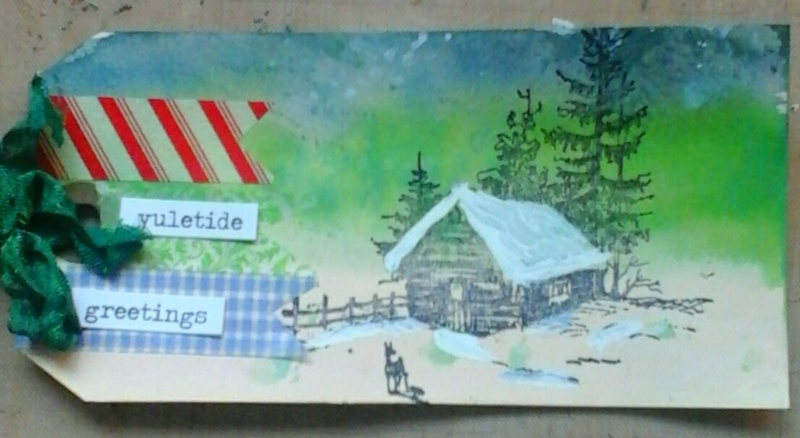 I had gingham washi tape sitting on my desk and had visions of a winter wonderland in my head....So out came Artistic Outposts Midwinter stamp set. I took my tag and wet it, swiping it with stormy sky distress stain, mowed lawn and picket fence. 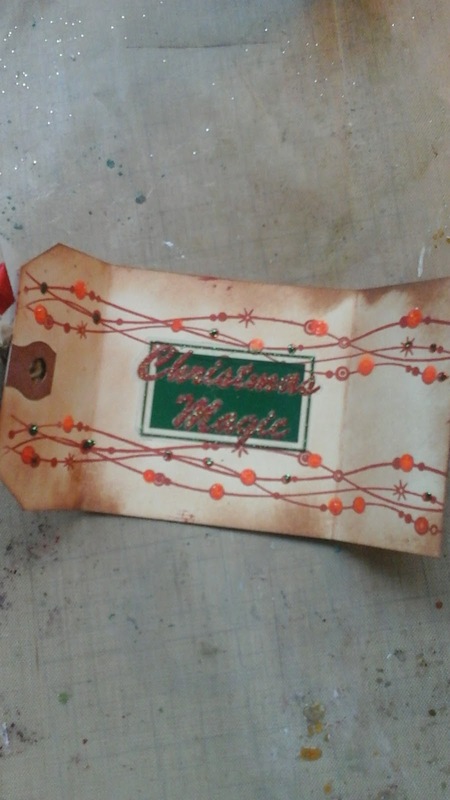 I splattered it with water, dried it, stamped it and put the ribbon on. It looked barren so I used a little Dylusions white linen on the roof for texture and snow and added the greeting. Yes, of course from the funkie junkie boutique. Tag 9: Can you see the shimmer? 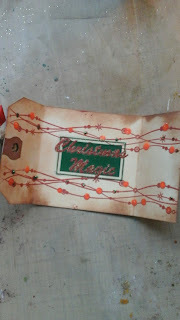 I used Lindy's Stamp Gang spray for the background and it glimmers and shimmers so lusciously! Enamoured of Linda's background, and not owning any of those supplies, I improvised. 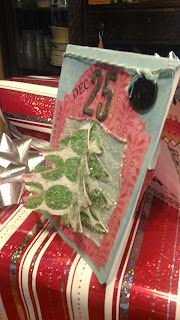 I used Dyan Reavely's snowflake stencil and Wendy Vechi's embossing powder, both from The Funkie Junkie. When dry, I sprayed with Rudolph's Nose Red and Bells of Ireland Green. 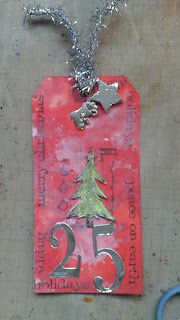 I then took Tim Holtz's pewter paint and dabbed gently over the embossed area. The tree was stamped from a CTMH set and the garland and stockings are from The Funkie Junkie. Linda's tag this time was beautiful. I wanted that thick, sturdy, luscious border. In mucking out my room, I had found this piece of corrugated board that I had slapped with ?gesso? and forgotten. I cut it to the #10 tag size and made a bigger project this time :) I liked that neutral, soft palette, so I stuck with that theme. 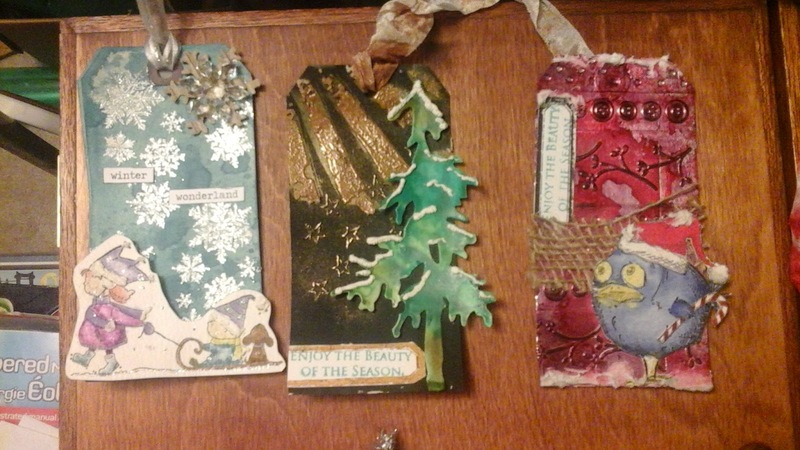 This tag is almost all found material and scraps from my desk. 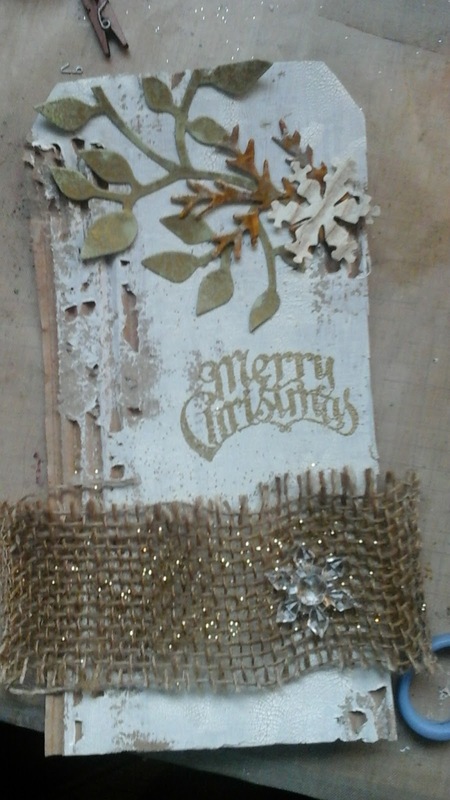 I took a scrap of burlap and drizzled glitter and glue on it for sparkle. The greens were leftovers from other projects and were all sprayed with tattered angels glimmer mists. Merry Christmas was embossed in gold from a Tim Holtz mini Seasonals set. The snowflake was from Lindas shop, The Funkie Junkie Boutique. 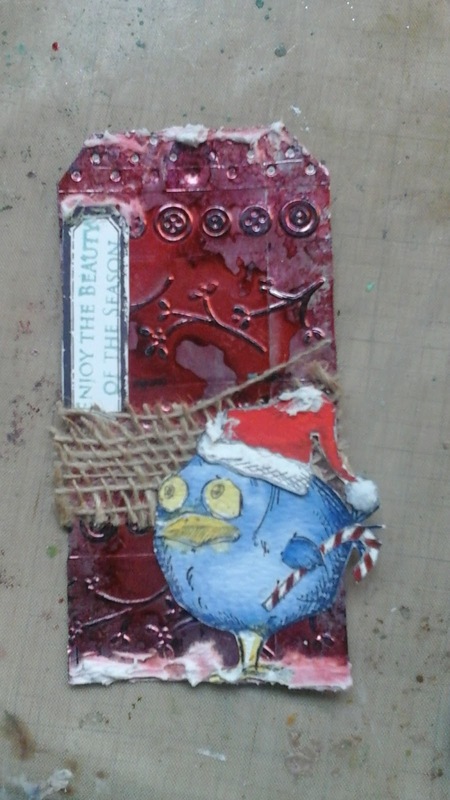 This tag made me late :( I used Lindas technique of mixing gesso and rock candy crackle and left it to dry. I liked that background but it was really white, so I dabbed it with salty ocean stain and tumbled glass and rubbed it into the cracks. It's pretty, but light. 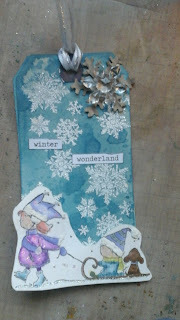 I took Wendy Vechi's embossing paste and spread it across the bottom of the tag and pressed miscellaneous beads into it. I was hoping for a little haberdashery look, but I think I needed to play with it more. 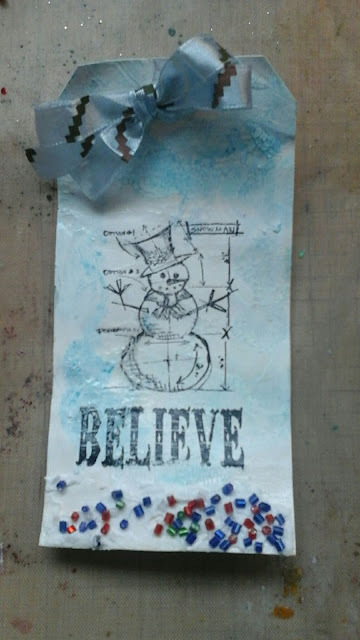 I stamped the tims mini blueprint snowman and the Believe (tims mini seasonal) in Staz On ink. On an aside, it was dried right out and a little rubbing alcohol brought it right back :) ). The ribbon came with the beads and looked right, so on it went :). Tag 12: Last and tiniest :) I like this idea! 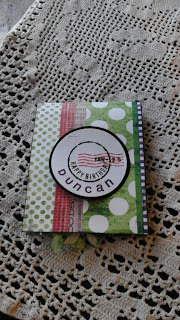 I wondered how Linda's CardI would pull off Lindas Card with my tiny tags, but here it is. Stamped with a CTMH background stamp in cranberry and New England Ivy, and another CTMH border stamp on the inside. I added Tim's distress glitter Stickles and a sticker off my desk. The wee tag star and ribbon on the outside are all scraps. Now my desk is cleaned off and my 12 tags are done, lol. Great Challenge Linda, I enjoyed every frantic minute of it! 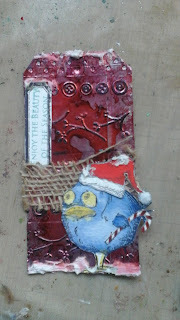 I love that Linda has started doing this in lieu of Tim Holtz's 12 tag Challenge. I have been meaning to join all fall, but found that Saturday Dec 26 was my first chance at it and I am going to cram as much crafting into this weekend as I can.....Here goes! These run across in order, as I am posting all in one shot. My camera is awful. I am trying out my new tablets camera and am less than excited. Tag 1 : as I look back I had to wonder where I jumped off the original tag that Linda posted. 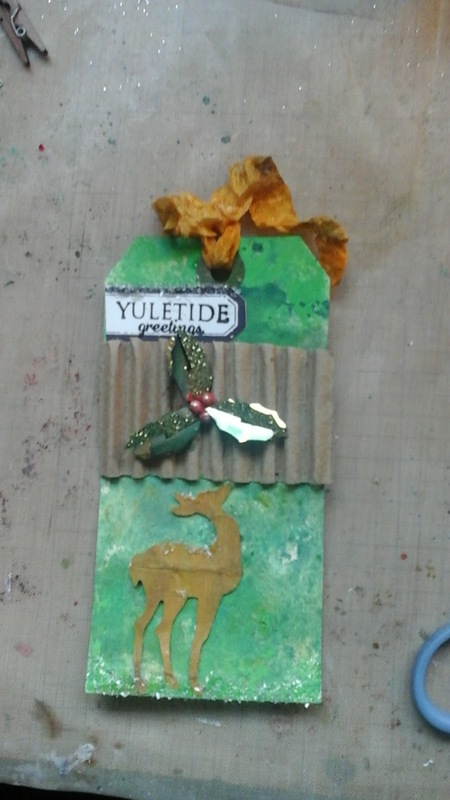 I was inspired by the background of gilded poinsettias all glittering there. 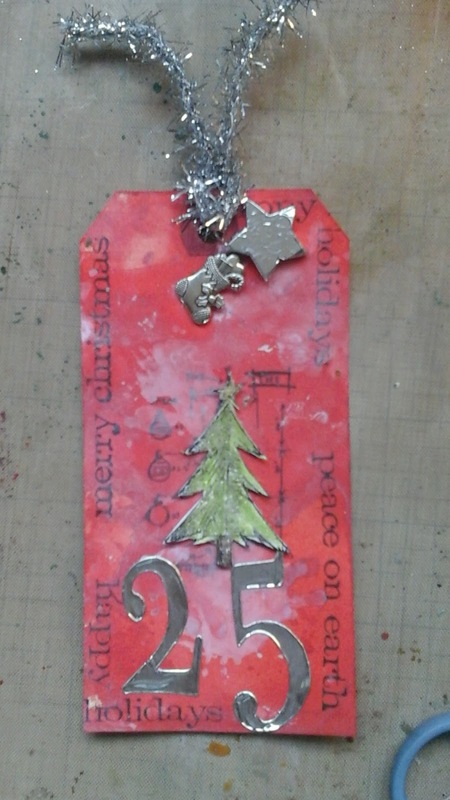 I embossed my trusty snowflake stamp from Tim Holtz's mini holidays stamp set a beautiful silver and white, although my camera refuses to show the colours :(. The seasonal chitchat and a cute stamp from ?. Eat Cake graphics? I think. My favourite winter stamp of all time. Tag 2 is almost a direct copy of Lindas tag found here. I used a tree I had from one of Linda's special treat bags that come with your order at the Funkie Junkie Boutique. 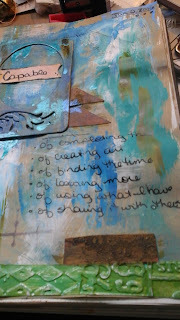 I ended up using white embossing paste over the rays and painting with Tim Holtz tarnished brass distress paint. 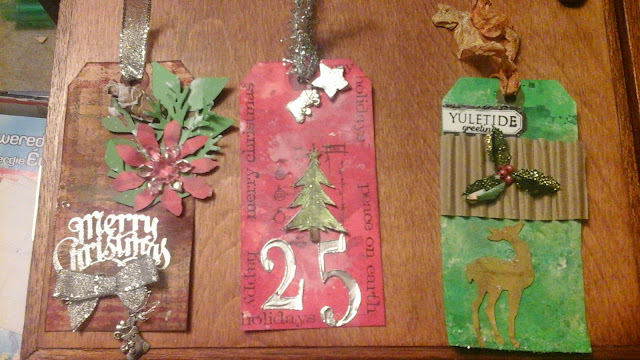 Tag 3: Completely fell in love with the idea of the panels and the shine so I dug out an old cuttlebug embossing folder, really 5 mini folders that work together and embossed my metal tape. I used alcohol ink to colour it and had to pick an image to finish. 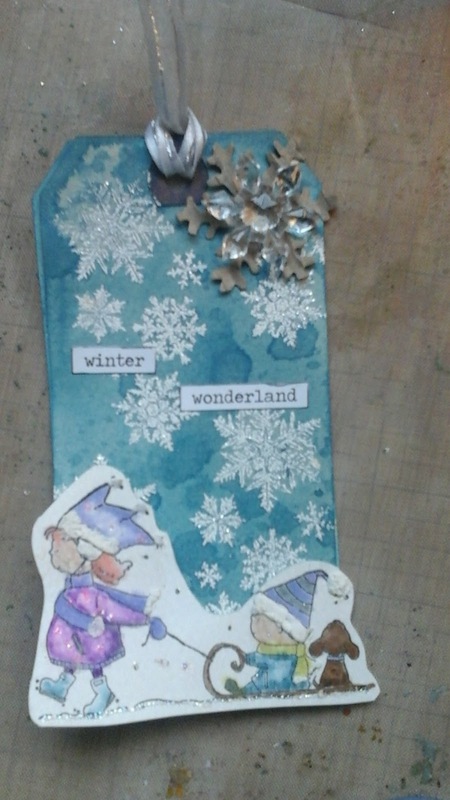 I had to use a bird somewhere as that was to be my focus for every tag....but my dies haven't come yet to cut the little guys out and I'm short on time :) a little white embossing paste snow and BAM! 3 done lol. Tag 4: Gee, I wish the camera worked. This plaid was amazing IRL. 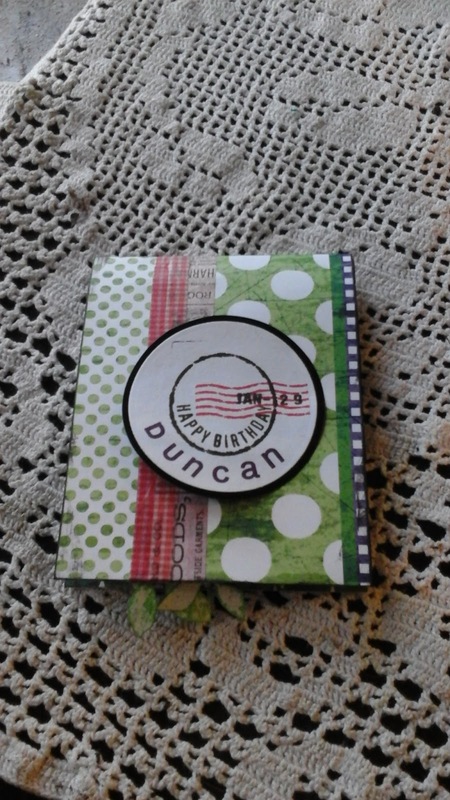 I used festive berries and evergreen bough as Tim did with his June Tag. 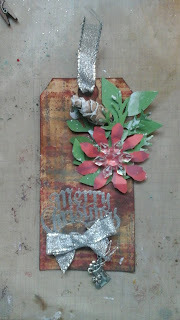 I added a little greenery, a silver embossed greeting from Tim's Mini Holidays and a trinket and bow. See Linda's original here. So pretty...I must use this more often! Tag 6 : Half way! Love that corrugated look, but wasn't getting anything from Linda's tag this time 'round. Nothing that fit my wee tags anyway. 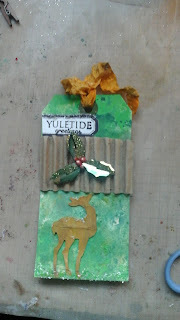 I started with my wee corrugated piece, grabbed my deer diecut...that I found while cleaning up my messy room *hehehe* and I cut her out of a leathery scrap that I found. This snow was from Diamond dust.....so much fun seeing how I can create versions of snow with what I have. That's my first 6 done :) I don't know if I can churn out 6 more in time to enter the competition this year, but it's sure fun trying. 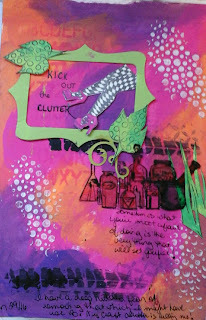 Thanks so much Linda for firing my creative energy back up....I have been quite stuck for about a year. My first ATC box, but not the last. 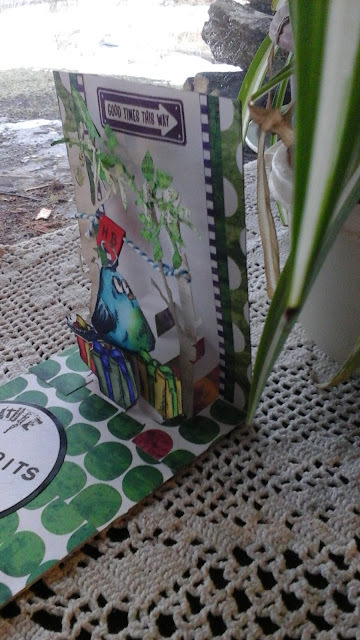 I started by cutting the box out on my cricut using the Artiste cartridge. I then got to use Tim's marbling tech with the distress paints. This is the first time that I have done it and liked the results. Probably because I finally caved and bought new colours of paint from Linda at the funkie junkie boutique. My Key was created using the distress glitter on a piece of kraft paper. I markered up the birdbath and blew on it to reactivate the ink. This stamp is from a set that a lady made and sadly didn't get to keep creating. The collection blew me away and I love every stamp. I found a fun challenge by browsing my latest crush at Layers of Ink . It's scenic stamping. 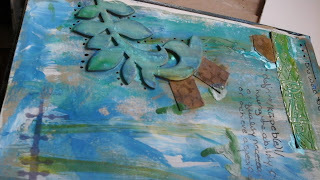 I have always wanted to use my stamps in this way and combined quite a few stamps in my creating. 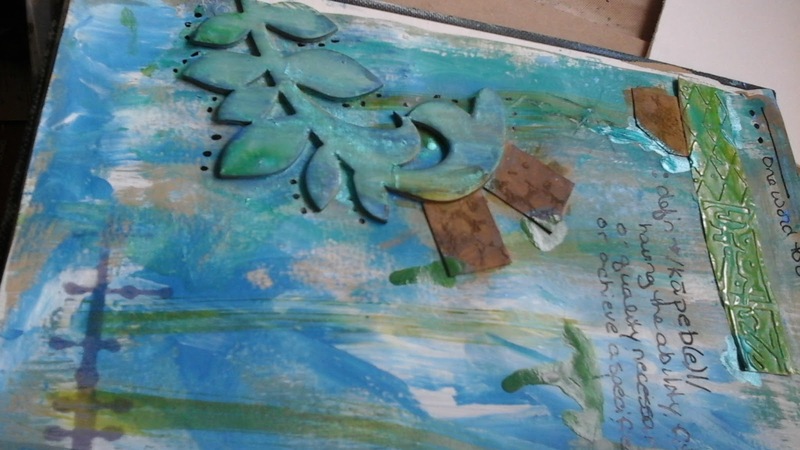 The background started out as Tim Holtz's April tag and was rejected. 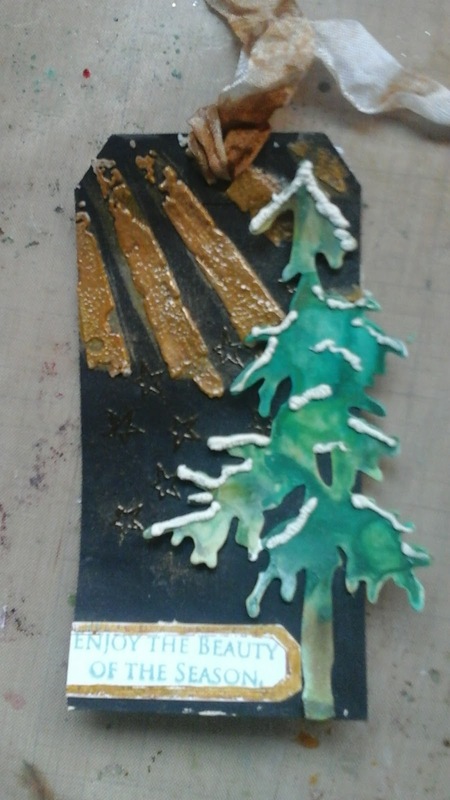 I had used a mustard seed paint and it went lime green. The tissue tape is there...... 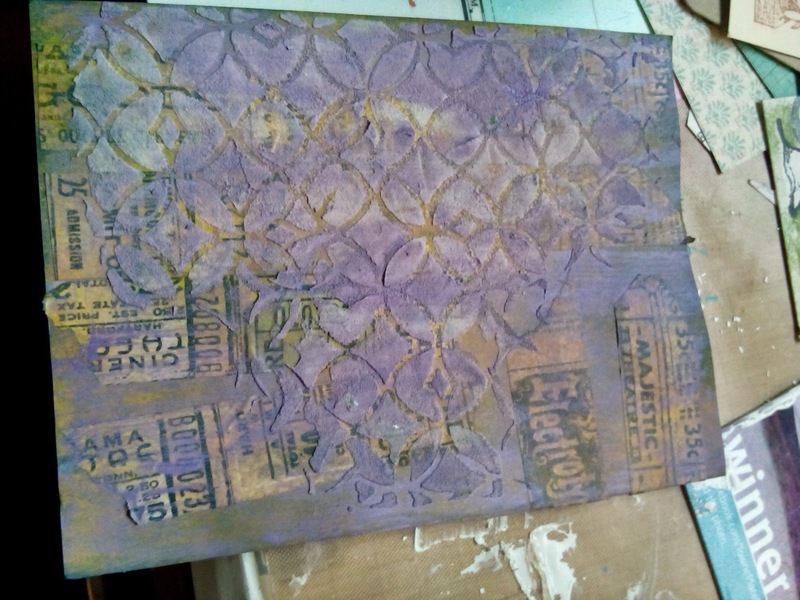 I was trying to figure out how to resurrect it when inspiration hit and I stenciled over it with embossing paste and a tim holtz lattice stencil. 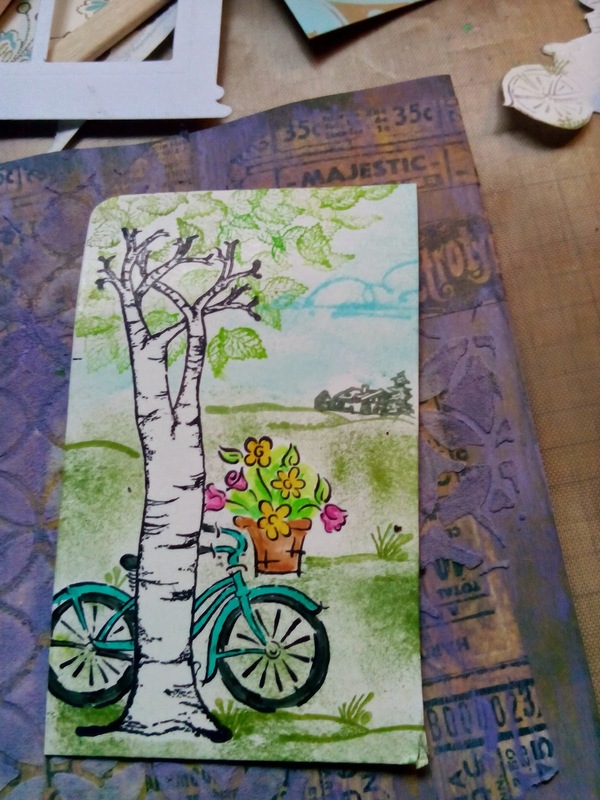 I then used my purple tim holtz distress paint because I wanted to see what colour of purple it was :P, I mean the piece was already rejected, so why not? 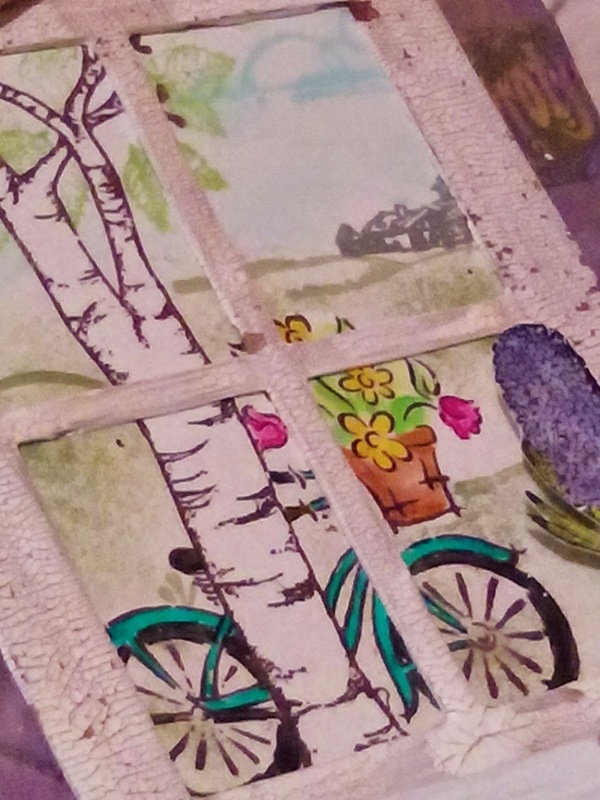 I distress crackle painted the window frame to look like an old farmhouse window, popped up the window box and set a hyacinth blossom on the ledge. I love that bicycle stamp, its close to my heart. A bunch of the stamps are from an older company, firecracker stamps. I used old Close to My heart markers for colouring. I made it for an artistic friend of mine that just retired. I'm nervous sharing because she is talented, lol. I do like the way my castoffs came together and cleared my desk. I am entering this into the challenge for scenic stamping at Craft a Scene and the words challenge at Frilly and Funkie.